Every modern operating system necessarily has some type of music playback app. It's nonnegotiable—like including a calculator or offering the ability to print. But gone are the days when users loaded Windows Media Player to play back local MP3 files—and expected nothing more. Today people want full music management tools, a storefront for purchasing music, and even streaming services that let them listen to music for free (or for as close to free as the music industry allows). Does the built-in Windows 8 music app deliver on all of these modern promises? Or is it like certain other Windows 8 apps that provide only rudimentary features—and practically force users to download better third-party apps? 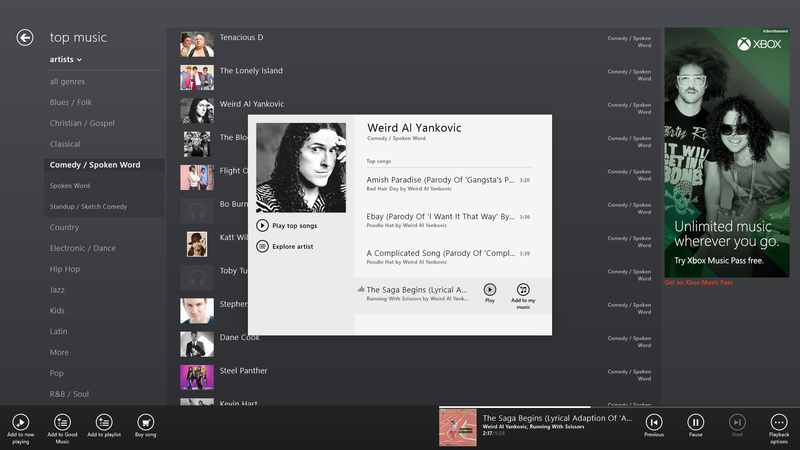 Well, here's an encouraging development: The new Music app in Windows 8 hooks into Xbox Music, a streaming music platform that provides access to 18 million different songs across a vast array of commercial libraries. Jumping on the popularity of Pandora's unique music-discovery features, Music offers its take on the theme: its Smart DJ tool. From the 'now playing' section, you can select 'New Smart DJ', which brings up a prompt to enter an artist's name. I challenged the tool with some of my most obscure favorites, and Smart DJ found them right away, instantly playing their tracks and related music from the same genres. When you select a new artist with Smart DJ, that artist instantly receives its own tile in the 'my music' section; each tile is akin to a channel in Pandora. After spending considerable time with each artist's channel, I realized that I wasn't skipping over songs as I so often do in Pandora. This speaks volumes for the intelligence of the Smart DJ algorithm. 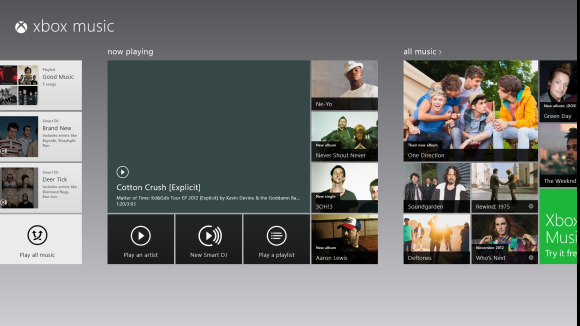 Even better, the Xbox Music service offers unlimited song skips, so you'll never get stuck with a song you can't stand. You can also view the song list for Smart DJ's upcoming picks—and all of the songs it has already played—in case you want to jot down the name of something you especially like. All of these features are free, as long as you're willing to endure some ads. If you're in the mood for a particular artist and don't want a bunch of other bands muddying up your listening experience, Music has you covered. The 'Play an artist' feature works similarly to Smart DJ, but plays only tracks from your chosen artist. You get to hear all of the performers you enjoy, with no duds in the mix (unless you count advertisements). While playing any individual track, you have access to the artist's biography and discography, including random band pictures and album covers, and a comprehensive overview of the artist's creative output. If nothing else, you'll be able to see whether an awesome new band that you just discovered has released anything recently, or stopped recording in 1989. 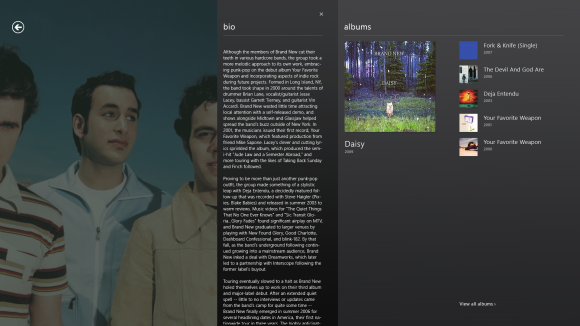 Check out a band's bios and previous albums while listening to its music. The streaming Xbox Music service includes such offbeat genres as comedy music, stand-up comedy, and spoken word. With a little exploration in the 'all music' section, you'll surely uncover something you'll enjoy. Dig deep enough, and you can even find seasonal and Christmas music selections to drive yourself nuts this holiday season. Everything is fully streamable; and like Spotify, Microsoft constantly updates Music with the latest albums and singles. In fact, Microsoft boasts that you could listen to Xbox Music continuously for 80 years and never hear the same song twice. Of course, that claim is premised on the assumption that you enjoy a very, very wide range of music. Polka anyone? 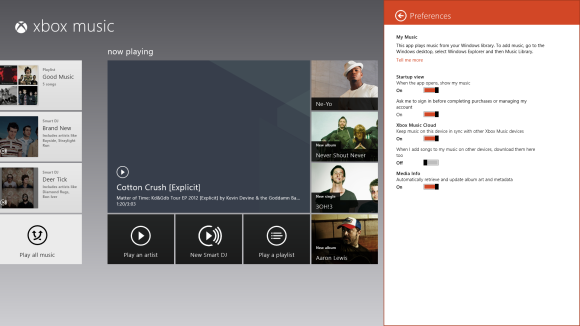 Despite the depth and intelligence of its streaming Xbox Music service, Music drops the ball as a playback and management app for personal, local content. If you succeed in finding the 'my music' section in the chaos of the main screen (hint: it's all the way to the left), you may discover that it's empty. You have to move every audio file that you want included to Window 8's Music folder—and shortcuts won't cut it. This is a huge problem for people who keep their media on a separate hard drive to save room on their C: drive. The user interface is far too congested for something that should be as simple as a music player. Perhaps the problem is that Music is more interested in selling you music than in letting you play back tracks that you already own. Everywhere you turn, you'll run into a new tile pushing the latest trendy artist. Those tiles also provide access to direct streaming, but I wish that Music could learn my personal tastes, if only to prevent that Beiber kid from popping up everywhere. So many tiles, so little direction. The actual music player function in Music—that is, the closest thing the app offers to Windows Media Player—is scarcely visible and requires much hunting to uncover. To control your music, you must use the larger tile in the 'my music' section or the even less intuitive Option bar (right-clicking it or swiping up from the bottom). And when you locate the music player, you may be disappointed to find that it's a simple, bare-bones interface that lacks precision control and significant depth of information. You can see the music player in three ways: The top left is when you use media keys; the middle is when you use the large tile in 'now playing'; and the bottom right is when you use the Options bar. 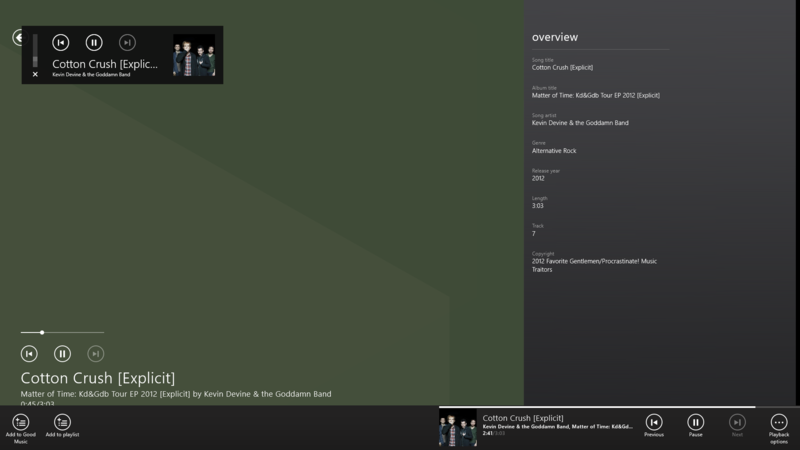 On top of that, you can't keep a "mini" version of the music player onscreen while you work in another Windows 8 app. Though you can run the full Music app in a snapped window, this arrangement consumes much more screen real estate than any music player ought to require. Curiously, a small version of the player shows up when you use one of the media control keys on a physical keyboard, but it quickly disappears. So the mini player exists—but you can't make it a persistent part of the Windows 8 experience. Another issue involves streaming audio pricing. When you activate Xbox Music, you receive free streaming music for six months, marred only by the hassle of some advertisements (which take the form of audio ads between tracks, and visual ads that appear on screen). After six months, this ad-supported model shrinks to a maximum of 10 hours of streaming music per month. Still, it remains a pretty nice deal, given the breadth and depth of the music catalog, and the unlimited skips. If you want to ditch the ads and enjoy more than 10 hours of streaming music each month, you can throw down for Xbox Music Pass. A subscription fee of $10 per month or $100 per year yields unlimited, ad-free streaming or downloading to any Windows device. Unfortunately, Xbox Music (in all its iterations) is limited to the Microsoft universe. To use it, you'll need a Windows Phone, an Xbox, or a Windows PC. Now let's take a look at the settings from the Charms bar when Music is active. 'Account' is where you can monitor and manage everything pertaining to your Xbox account. This includes the checking statuses for your various paid services, such as Xbox Live and Xbox Music Pass, redeeming codes to add money to those accounts, managing the devices you have synced with Xbox Music, and selecting various billing options. 'Preferences' covers five adjustable settings, each offering the simple choice of 'On or Off', and many dealing with devices that you would sync to your account. The rest of the settings include 'About' (with technical information about Music), 'Feedback' (which lets you provide feedback on the app), 'Permissions' (listing the different things you have agreed to allow people to use), and 'Rate and Review' (which takes you to the Windows Store to review the app). Throughout the Music app, there are various options depending on which song is selected. The Options bar maintains a standard format, with the highlighted song's options on the left side and a simple music player on the right. Song options can be anything from adding the selected song to a playlist to buying the track. The music player's options are standard: You can click 'Previous', 'Pause/Play', 'Next', or either of two 'Playback' options (repeat or shuffle). It took me a moment to realize that the options shown were for a song I had highlighted—and not necessarily for the song that was currently playing. This design permits you to manage playlists and to purchase music without actually playing it. Music contains two basic areas, both of which allow you to listen to good music. The 'my music' section includes everything that you've added to the music folder as well as any saved streaming music. It's basically the hub for the stuff you like. The other area holds everything else. From today's top artists and songs to any kind of musical genre you can think of, the app is a gateway to a world of music that's ripe for exploration. Just remember to add the stuff you like to your 'my music' section so you won't have to venture through the unbearable each time you want to hear some good tunes. Next page: Some nifty tips and tricks, and some Music alternatives.